Giallo comes to us from our friend Elena Sparaventi of " Di Fanum Fortunae" kennel in Italy. We were so thrilled when Elena said there was a girl for us. Giallo travelled overland to our good friend Lynne Page from "Halesbern" kennel in the UK where she stayed for 6 months before making the long flight to Australia. Quarantine was quite rough on our girl so it has taken some time for Giallo to get used to Australia, but she is settling in well & is Paul's "helper" around the garden. 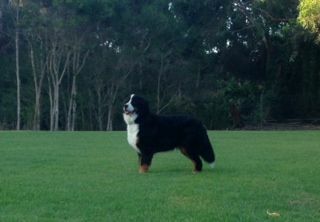 We can't thank Elena enough for entrusting one of her beautiful dogs to us & we are very excited to see what Giallo will add to our gene pool here in Australia.